At The Law Firm of Michael S. Berardino, we believe in defending our clients’ freedom through a forthright assertion of their rights before the court. With extensive experience in litigation and negotiation, our objective in every case is to obtain the best possible outcome for our clients. We represent clients throughout the New York City metropolitan area who face all types of criminal charges including DUI/DWI, property crimes, violent crimes, drug possession charges, sexual offenses, and white-collar crimes. As former prosecutors in the Office of the Bronx County District Attorney, we prosecuted every type of crime. We learned how prosecutors analyze cases, and how they prepare and pursue criminal charges. We learned how they shore up the strengths and minimize the weaknesses of evidence. We learned how to challenge procedural motions and how to persuade a jury. As accomplished criminal defense lawyers, we put our knowledge gained as prosecutors to work for our clients. We know how to effectively challenge the prosecution by attacking the weaknesses of their case. We know the rules of evidence and how to contest the introduction of improperly obtained evidence or that which may be prejudicial to our client. Lastly, we know how to make effective and winning arguments before the court. If you face DWI or drug possession charges, or a white collar or Internet crime, we will defend you. You can expect our complete devotion and dedication to your cause. We believe in aggressively defending our clients to protect their rights and their freedom. 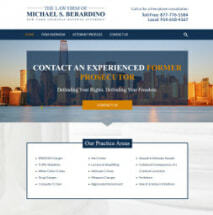 If you have been charged with a DWI, weapons charges, or any other crime in the New York City area, contact The Law Office of Michael S. Berardino, as soon as possible, locally at 212-983-5677 or 914-618-4167, or Toll Free at 877-776-5584. We believe in defending your rights and your freedom.